Vibiana is one of the most beautiful wedding venues in all of Los Angeles, a city with an incredible variety of wedding venues. The former church has incredible classic architecture, complimented by a modern aesthetic thanks to its beautiful, dark, wood floors and clean, white walls and ceiling. 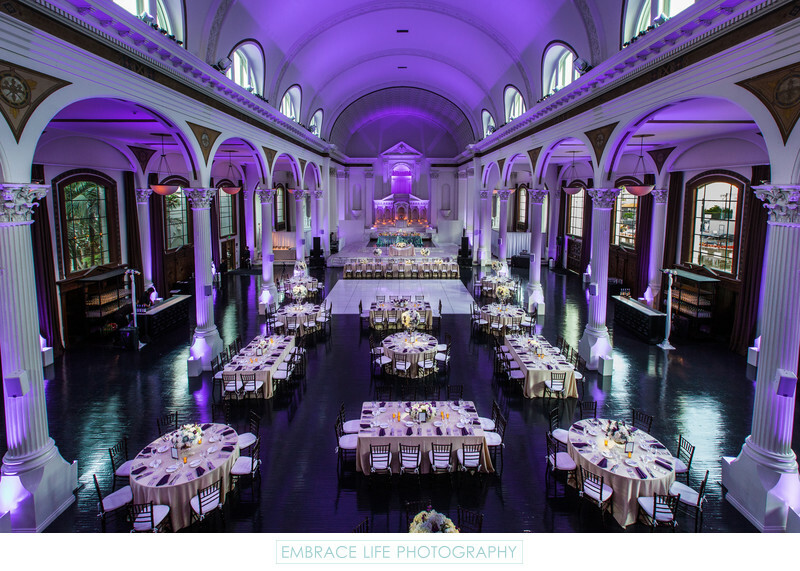 This wedding reception, designed by Deanna Tat of Chic Ambiance Events, features purple uplighting a combination of rectangular and round tables, purple napkins, a white dance floor, a gorgeous dessert table with a sparkling, turquoise sequin tablecloth, and incredible flower centerpieces by Butterfly Floral and Event Design.